Don’t Worry, Live Simply, & Love Everyone. Home » Posts Tagged "life"
Here comes some cliche advice, but stick with me here. You are the author of your own story. I’m sure you’ve heard that or something like it before. I don’t think I made it up, but what does it really mean? The basic cliche is that you are the sole author of your life. You create your life. You decide what your life is going to be like. Of course there are extra characters that come into your story and influence it and you. There are extraneous situations you find yourself in that effect where you go and what you do. At the end of the day however, it is you who decides how you handle these things. It is you who chooses how to react to things out of your control. You continue to write your own story whether you feel like you are in control or not. Now cliche aside, how can get something practical out of this metaphor right now. Stuck in a rut? Write your story. No really, write it down. Every day, write down what your main character did that day. You are the main character in case you forgot. Make it brief. Bullet points are all that is needed here. Write it down for 30 days and see where your story is going. Grab a notebook or open up a Word doc and just jot it down each day. You can even use a nice little service like Oh Life to help you journal the highlights. You get the idea. Now after 30 days, review the script of your life. Is it what you want to be doing? Are you living the life you want to be living? Are you shocked at the repetitive nature of your routine? Are you creating the life you want? Would you even read your life story? Hopefully the answer is yes, but I’ve given some monotonous examples for a reason. Sometimes we get so caught up in the routine, that the routine becomes invisible and we don’t see it. We can’t see it. The routine is what we are calling a life. We get up, we do A, then B, then come home and do C and D and we go to bed to rinse and repeat tomorrow. Now here comes the twist and how we fix the rut. Write your new story. I don’t mean go out and automatically just live the life of your dreams, but if you can do that, then yes, do that. I mean write down your new story. Take a new piece of paper and write down what you want to do. Write down some things you think would be fun to try or accomplish. Write down some places you want to go. Write down some new activities you think you might enjoy to replace some of the boring routine ones on your list. Write down what your days should look like and then start living off that list. Start crossing those things off as you do them and keep adding new ones onto the list. Call it a bucket list, call it a wish list, call it whatever you want, but seriously spend some time thinking about the things you want to accomplish and the things you want to do, and the places you want to go and the experiences you want to have. Then just start doing them. Some of the items may be big huge plans or ideas that may takes some planning, so start taking bite size chunks off of those ideas and work toward them. Some right require a simple Google search to find when you could take that next white water rafting trip. Make plans. Come up with ideas. Write yourself a new story and go make it happen. TSA = Truly Simple Actions The goal of the TSA project is to improve your life and help make this world a better place, one simple action at a time. Take time this week to do this one simple thing. TSA#24 – How Happy Are You? I want to provide a truly simple way to make people’s lives better. 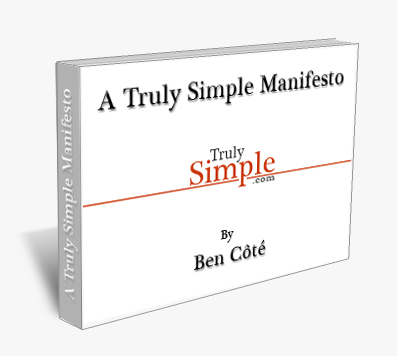 Copyright TrulySimple 2011. Remember: Don’t Worry, Live Simply, & Love Others.